The Twist HD Camera provides you a 300-degree motor-driven panoramic view, and streams live HD video right to your smartphone. Receive instant video alert notification when the system detects an activity. Features adjustable sensitivity motion detection, automatic infrared night vision, and mic and speakers for 2-way audio. Alert people at home with Shuttle built-in siren in an emergency. Zero-pairing technology means you can install your system in minutes. Plug in devices and download the free Home8 app. Get started with no configuration needed. No contract, no monthly fees required. Free local storage and cloud backup included. Includes 2x twist HD cameras, 1x security shuttle system is easy to expand so you can build a customized Home8 system that fits your specific needs. 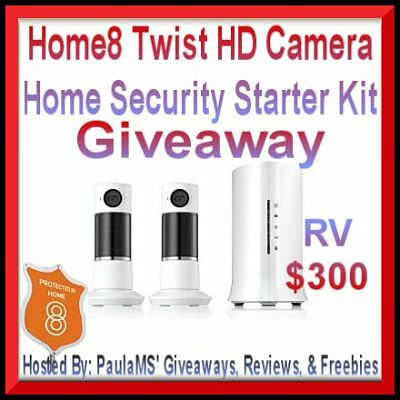 A few weeks ago we received a Home8 Twist HD Camera Home Security Starter Kit. Having a great curiosity of today’s electronics and the progression that has taken place in its use for entertainment, communication, and now security I was intrigued when I saw how advanced this system was. This particular kit is compact, discreet, expandable, and multi-functional; yet is still extremely user-friendly. After following the easy installation steps and accessing the system from my phone to my pleasant surprise, a video image appeared of what was going on inside my home. Isn’t technology great? One feature that we had never seen before is that we can twist these two HD cameras 300-degrees using the app on the phone to see more area and get better coverage. The quality of the video from these cameras is comparable to several of the commercial surveillance systems that were installed in places that I worked as a manager and had many opportunities to review the footage. When we thought it couldn’t get any better we were happy to learn that these cameras also have night vision, two-way audio, and a local video storage. I have really enjoyed exploring this high-tech system and it’s endless placement options. As our needs grow we are eagerly looking forward to expanding our system with the available add-ons and will also be using it in multiple locations in the future since we can do it with just one app. All the features that this Home8 Twist HD Security Camera Starter Kit offers are what sets this kit apart from so many of the others on the market and makes me confident in recommending it to others. How would you like to experience the security and peace of mind that this system can offer for free? Thanks to this wonderful sponsor one lucky reader is going to get the opportunity to do just that! Just enter on the widget below for your chance to win one of these exceptional kits. Get Your Home8 Twist HD Camera Home Security Starter Kit HERE. Disclaimer: PaulaMS’ Giveaways, Reviews, and Freebies will be responsible for mailing the prize which has already been provided to her by the sponsor. Any Questions about this giveaway? Email Paula At paula_stewart (at) ymail (dot) com.Disclosure of Material Connection: PaulaMS received the products mentioned above for free to facilitate the writing of this review. Some of the links on this blog post are affiliate links. This means if you click on the link and purchase the item, I may receive an affiliate commission. Regardless, she only recommends products or services that she uses personally and believes will add value to readers. I am disclosing this in accordance with the Federal Trade Commission’s 16 CFR, Part 255: Guides Concerning the Use of Endorsements and Testimonials in Advertising. Your review on the Home8 Twist HD Camera Home Security Starter Kit made me very happy. I sure will tell others. thank you.